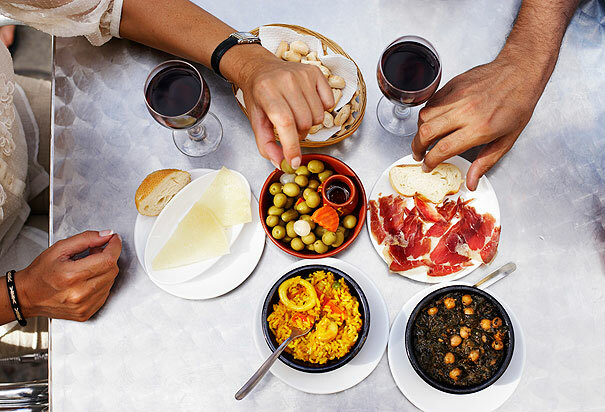 Being a cosmopolitan city in Spain, Barcelona is known for adapting to all different types of cuisine from around the country and around the world. The most famous? Tapas. Tapas have a longstanding history within the Spanish culture, and have transformed into one of the most delectable traditions in the Iberian Peninsula, including in Barcelona. The first tapas were originally seen in the south of Spain. These small snack-like treats were served with beers, wines, and Sherries, making them the perfect pre-dinner bite. The most common type of tapa was a piece of bread with a cold meat, usually ham or chorizo, piled high on top. Today, tapas can be found hot, cold, big, small, on breads, on plates, on toothpicks, in bowls: you name it. Tapas are perfect for sharing with friends and you can even combine some of your favorite dishes to create a filling main meal! Pan con Tomate: A traditional Catalan tapa. White bread is rubbed with tomato and drizzled with oil and salt, and sometimes served with Manchego cheese. A perfect accompaniment to the rest of your tapas. Patatas Bravas: The chips or french fries of Spain. 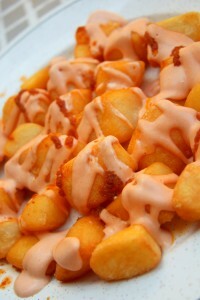 Small, deep-fried cubes of potato served with two sauces – alioli (a garlic mayonnaise combo) and a spicy tomato sauce. Croquetas: Tasty and especially good on a chilly day. These breaded rolls of potato with ham, fish, chicken or spinach are fried and served hot. 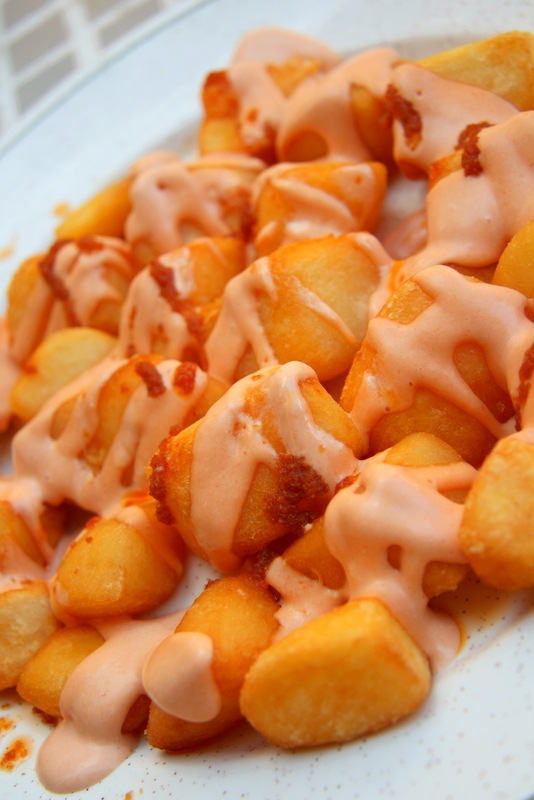 Patatas bravas are one of the most delicious and traditional forms of tapas served all throughout the city. As mentioned above, these square-cut potatoes are doused in a special spicy sauce, making them irresistibly delicious. 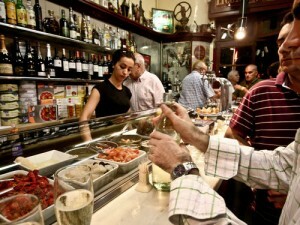 However, if you’re looking for the best, you must try them at Bar Tómas de Sarrià. Located in the Sarrià district, this traditional little tapas bar is known for its outrageously amazing fried potatoes served with a secret house brava sauce. Mostly young people and locals gather here for a taste of these delectable treats, while also munching on many of the other fabulous tapas Bar Tómas has to offer. What many tourists don’t know is that the traditional tapas, still served in the south of Spain, are actually free! Though most bars will charge you for larger portions such as sandwiches, many tapas in the southern regions of the country come free when ordering a drink. Atrapatapa is one of the few tapas bars in Barcelona that maintain this tradition, offering free tapas when a guest orders a glass of cava, or champagne. With over 15 choices of tapas to choose from, and prices starting at 1,20€ for cava + one tapa, you can’t get a better deal! Over time, tapas have started to develop into various forms depending on the region they are from. In the Basque Country of Spain, these mouthwatering appetizers are called “pintxos” or “pinchos”. Similar to traditional tapas, most are served on top of a small piece of baguette and held together with a toothpick. These scrumptious treats are served with tasty txacolí, a dry white wine. Traditionally, the amount you pay for your pintxo meal is determined by the number of toothpicks left on your plate, some with different colors or sizes indicating higher or lower prices. At Irati Taberna Vasca, guests can choose to swallow down tasty monkfish, tortilla, shrimp, and more at the traditional bar or in the restaurant area. Visit this local bar with a classic atmosphere for one of the best tapas experiences around. Serving a variety of tapas with cava, you will find this champagne bar near the well-known Picasso Museum, in the Born District. Their canned seafood and anchovies are a particularly huge hit with locals and tourists alike. Come early to this traditional bar, as it starts to fill up around 8pm. 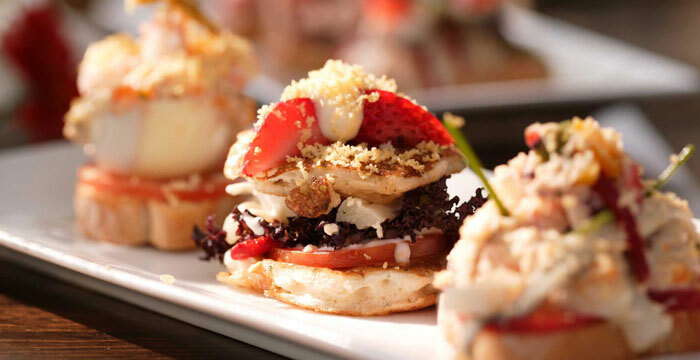 For fresh tapas so good they’ll have your mouth watering in seconds, you have to head over to Quimet i Quimet. Here, you will find an array of meats, fish, and cheeses coated in sweet sauces with fruits, nuts and more. A family-run joint, this place is known for its all-knowing bartender who will choose a delectable plate just for you, while you decide the drink. Lining the walls of this bar are bottles of wines and spirits from around the globe, as well as beer selections incomparable to any tourist bar. This is a great bar with an authentic Andalusian atmosphere, right here in Barcelona. Offering flamenco music alongside more than 50 different types of tapas, this bar has it all. Located just off the famous Las Ramblas, the menu includes plenty of seafood, as well as fresh ingredients straight from the Boqueria Market. Whether you’re visiting Barcelona for a week or you are looking to move here for a year, you simply can’t miss trying out some of the most delicious tapas in the Catalan capital. If you are staying in one of the many Barcelona apartments near one of the bars mentioned above, be sure to stop by and ask about their specialty, as almost every tapas place in the city has one. ¡Buen provecho! Check out Aparment Barcelona’s delectable video on tasty tapas in the Catalan capital! This entry was posted in Places, Restaurants & Food and tagged barcelona apartments, Barcelona food, Barcelona tapas, barcelona tourist guide, catalan culture, great tapas places, Restaurants in Barcelona, tapas bars. Bookmark the permalink.